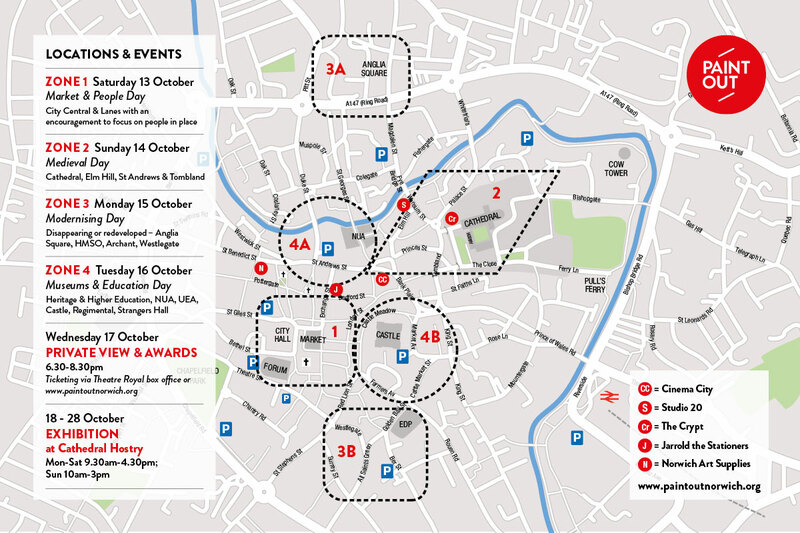 The Paint Out Norwich 2018 painting location trail map can be found in the Hostry Festival brochure and here. The 2018 painting sessions allow the 35+ selected artists to paint from anywhere within each session’s painting zone taking in some 10 locations & 20 points of interest. This year each location zone has a broad theme: Market (City Central & Lanes), Medieval (Cathedral, Elm Hill, St Andrews & Tombland), Modern (Disappearing or Redeveloped – Anglia Square, HMSO, Archant, Westlegate), Museums (Heritage & Higher Education, NUA, UEA, Castle, Regimental, Strangers). The artists will also get the opportunity to paint the Colman’s factory site and to draw from the Castle roof as well as try their hand at a digital tablet sketch walk. Members of the public can visit and observe the selected artists at work on Saturday 13th through to Tuesday 17th from 9am-5pm (8pm Sat & Sun) around Norwich – please check the daily agenda or map for exact session times. You can also book tickets to the Private View and Art Awards on Wednesday 17th October 6.30pm or view the Exhibition 18-28th October in the Norwich Cathedral Hostry.